This Easter season, join the Heavenly Lights campaign and give a gift that will shine for generations to come. Gift a virtual glass panel in honor, celebration, or loving memory. Your gift will ensure that this beacon of faith continues to light the way for Catholics and our community. 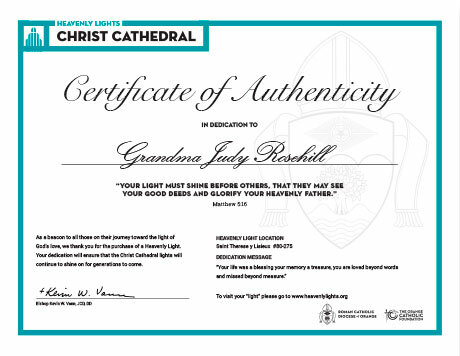 Join the Heavenly Lights campaign and give a gift that will shine for generations to come. Gift a virtual glass panel in honor, celebration, or loving memory. Your gift will ensure that this beacon of faith continues to light the way for Catholics and our community. 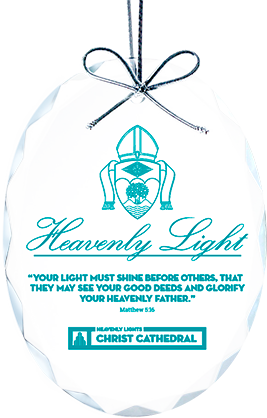 Receive a limited-edition Christ Cathedral ornament as an additional thank-you for dedications starting at $100.